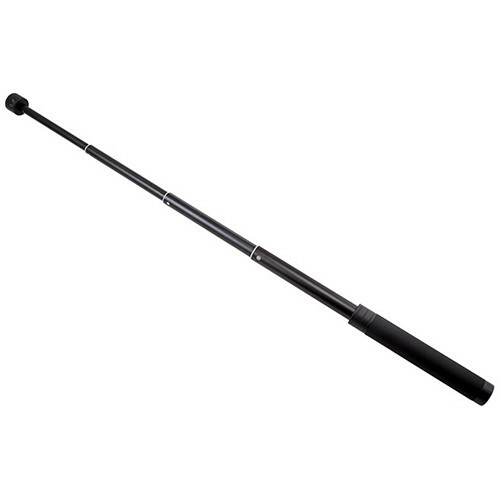 Telescopes from 7.5 to 28.8"
Although designed as an extension for FreeVision's lightweight smartphone and action cam gimbals, the FreeVision Extendable Rod can also be used as a handgrip or a selfie stick for compact cameras and phones. One of its special features is that when it's fully collapsed it can be twist-locked, so you can be sure it won't start telescoping out by accident. Collapsed and locked, the Extendable Rod measures 7.9". Unlock it and extend it out up to 28.8". An extension at the bottom of a gimbal allows for better overall handling of the gimbal, while a long-enough of an extension enables you to perform stabilized crane-style shots. The 1/4"-20 mounting screw on top secures the rod to the bottom of a gimbal or alternatively allows you to attach a camera, smartphone holder, ball head, or other accessory. A 1/4"-20 screw-hole on the bottom allows you to connect additional, similar rods or to attach a tripod or other support to the bottom.